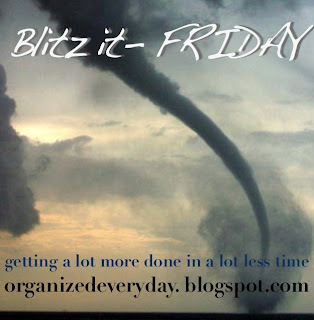 This was a crazy week for us, and I didn't get the blitz's done that I had planned. Maybe next week I'll be a little more productive. But I did get a short blitz in today. The kids were sitting down for an afternoon snack. My hubby and I took one look at the disaster in the house and knew something needed to be done and fast. Together, we spent 15 minutes hitting all the clutter that had accumulated this week. It is really fun to blitz with my hubby. We picked up all the toys,books and puzzles in the living room, dining room, bed room, play area and hall way - I'm convinced the kids were determined to pull out everything they owned and distribute it to every room in the house. We also had an unusual amount of clothing to put away. My son is recently excited about his "dressing" skills and had pulled out coats, pajamas and who knows what other clothing items to show us how he could put them on by himself. Then, while I cleared the kitchen table and counters, my hubby hit some piles of random stuff that had accumulated by the front door. It was short and sweet, but very satisfying! I'm looking forward to blitzing some major spring cleaning next week! I'll let you know how it goes. Wow! I've never quite gotten the hubby to blitz with me--he usually 'takes cover' when I'm in the blitz mode! About the kids: yes, they are too young to just be assigned something like "do the dishes", but they can be taught to obey simple commands like, "put this pony in the bin" and expected to do it immediately. The training part of this is huge, even if you don't get a lot done. My little one has learned some lazy habits because the older 4 do so much so efficiently that her way of dealing with blitzing is to hide in a corner and play.. so now we are dragging her out and making her do atleast one thing. I'm so thankful for a regular family blitz--once a day or so. Anyway, I'm rambling. Good job!